It’s been a little while — a quarter-century, in fact — since Jim Christian called New England home, but Tuesday afternoon that changed. “Not only the great tradition, not only the great athletic programs, not only the great support that we have from administration and everybody else,” said Christian, 49, who played at Boston University and the University of Rhode Island in the mid 1980s. “The goal now is to get the community involved, to get the students back involved in everything we’re doing. Bates said a number of factors made Christian the right fit, including his track record of success — postseason berths eight times in 12 seasons as a head coach, including the last two at Ohio University — and his values lining up with those of the school. Christian was 49-21 in two seasons at Ohio University. Previous stops for the Bethpage, N.Y., native included Texas Christian (56-73 in four seasons) and Kent State (138-58 in six seasons). It’s been a whirlwind week or so for Christian. 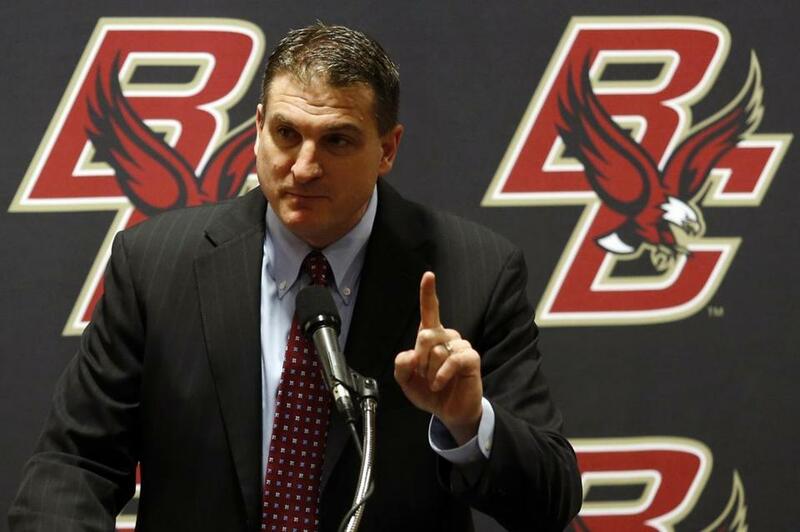 Since BC announced his hiring late last week, Christian went to Arlington, Texas for the Final Four to talk to potential personnel additions before flying to Boston Monday. That’s when he met with BC’s returning players. This was important, Christian said, because it has been an uncertain three weeks for the Eagles since Steve Donahue was let go after four underwhelming seasons. Christian knows how stressful that change can be. After two seasons as a student-athlete at BU, he transferred to URI when the Terriers made a coaching switch. Details of Olivier Hanlan’s future, however, were not among those things. The sophomore guard, who averaged a team-high 18.5 points per game in 2013-14, has yet to decide if he will return for a third year or enter the NBA draft. Christian said he has had “a couple of great conversations” with Hanlan and his family, including last week over the phone shortly after his hiring. Christian also briefly chatted with Ryan Anderson, who announced Monday he won’t return to BC for his senior year. That leaves the Eagles without their second-leading scorer and top rebounder. “The minute I took this job, I came here to get this group of seniors to enjoy their last year and get the most out of it,” Christian said. “They need to understand that. I’m not waiting for them to get through to get to the next guys. We’re trying to win. Maryland assistant Scott Spinelli and Mike Jarvis 2nd, who helped coach Florida Atlantic in recent seasons, have been linked to BC in recent days. Christian also offered some insight into his coaching personality, detailing his use of “identity plays” during practice to demonstrate how he wants his players to play. An identity play is, for example, when a player sprawls out for a loose ball, or when five teammates go over to help him right after. “It gives me an opportunity to praise and resonate in his mind, ‘This is who we are. That’s a hell of a — that’s a heck of a play,’” Christian said, stopping abruptly. “Excuse me. Catholic school,” he continued to a room full of laughs. Tim Healey can be reached at timothy.healey@globe.com. Follow him on Twitter @timbhealey.